Wayne Sawchuk is driven by a vision of humanity co-existing peacefully and prosperously with nature. While his ideal world may sound utopian, Wayne is very much a realist. He knows what it takes to bring government, industry and other stakeholders to the table to discover mutual interests and agree upon actions that maximize benefits for all - including the environment. Who is this man? This site features the photography of Wayne Sawchuk. Many are available for order or download in the photo gallery. A modern day explorer, guide, and conservationist, Wayne Sawchuk unveils wonders and mysteries gathered over a quarter century of travel deep into the largest wilderness remaining in the Rocky Mountains. He is an experienced presenter on subjects such as natural history, conservation initiatives, and the interface between industrial activity and the natural world. 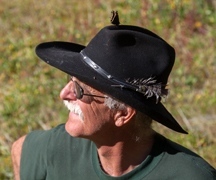 Wayne has participated in numerous multimedia interviews in connection with his books and conservation work, from region-specific publications to National Geographic.